With Summer fast approaching it’s nearly time to hit our beaches again. YAH!! Apply your sunscreen before you hit the beach. This one I’ve learned the hard way….I’ve had the kids desperate to hit the water and I’m madly trying to apply their sunscreen and then telling them they have to wait for 1/2hr! A good tip is to apply sunscreen before you hit the beach (½hr beforehand) and then take a spray sunscreen with you to the beach to top up. The spray sunscreen is handy if you have sandy hands. These are ideal to mark out an area for your family on the beach. The ones with the water-proof backing on the back are the best. You can lay your beach towel on top of these as well. Making sandcastles is always a highlight for the kids. Why not make an enormous one with a normal size bucket for around $1. You can take all your sand-making bits and bobs in this bucket and then it can double to carry the wet clothes home at the end. I love this one. Wrap any valuables (ie. keys, wallet, phone) in a nappy or old chip bag. Gold! We are currently downsizing from the mother-of-all-beach-bags to everyone carrying their own gear down to the beach in their own backpack. Their backpack includes a towel, sunscreen, hat and a change of dry clothes. 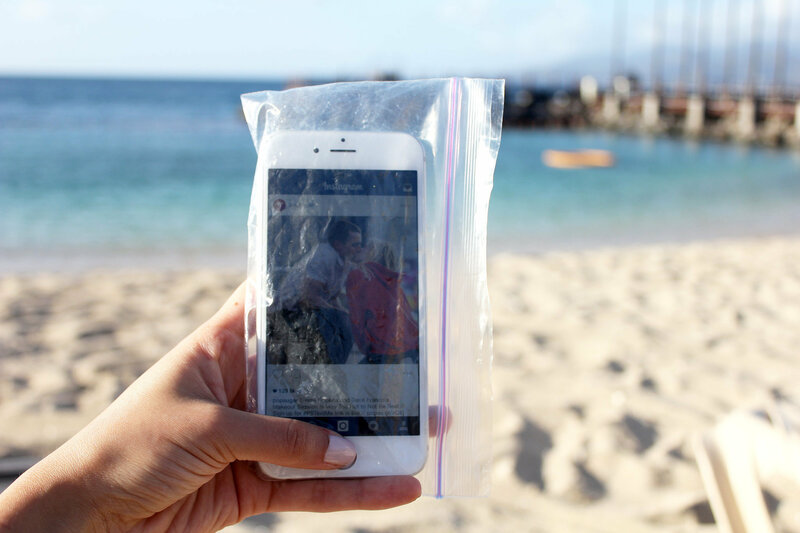 Before you leave for the beach pop your phone into a clear snap lock bag. This will protect it from water, sunscreen & sand and the touch screen still works perfectly well. This one is a lifesaver for the kiddos. When the beach is crowded it can be overwhelming for them to find their way back to your spot on the beach from the water. That’s when a flag or something distinguishable on top of your beach umbrella is a godsend. If you can find one of these mesh carry bags, they are brilliant. They are expandable so you can fit a lot in and the best bit is they let the sand fall through them. Even if you don’t take any other tips on board, this one is a must! Take a small bottle of baby powder with you to the beach for after their beach shower. It absorbs the moisture from the skin and allows you to brush off excess sand easily without it scratching or rubbing. their skin. Trust me, it is fantastic. Take a bottle of water with you in your bag. Frozen water is even better. it will melt enough while you’re busy swimming and playing and then the kids can have a drink at the end. Kids seem to be very thirsty when they come out of the ocean (or is it just mine)! It could even serve to wash sandy hands if need be. There we go – 10 easy hacks to make your next trip to the beach even better! Next Article Are Essential Oils Good For Your Family?